Martin Keenan sent us a list of Canadian Voodoos, which overlaps our list. Canada purchased F-101s in two batches. The first batch was purchased in 1961, consisting of 56 F-101B and 10 F-101F aircraft. The survivors of the first batch were exchanged in 1970 - 72 for 56 lower time F-101B and 10 F-101F aircraft. These second batch aircraft served as front line interceptors for the Canadian Armed Forces until the end of 1984. 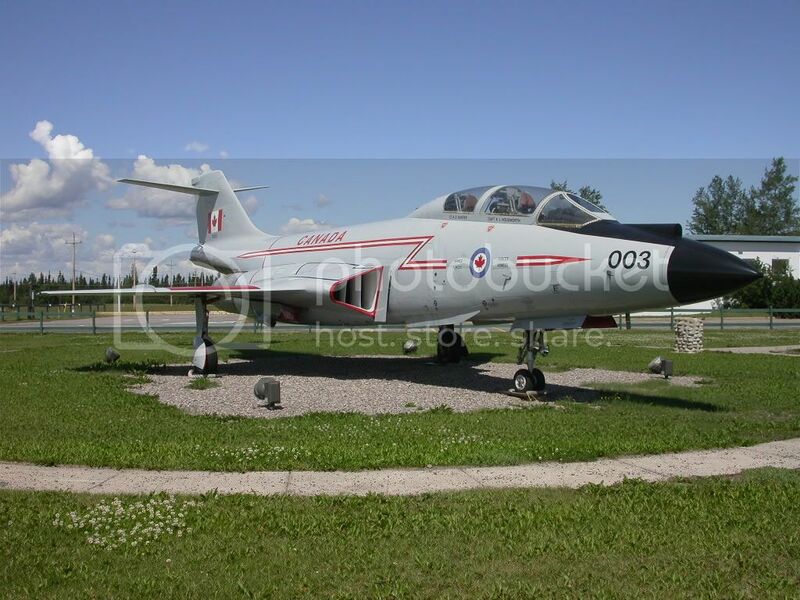 Additionally, one other F-101 (a unique electronic warfare conversion) was leased to Canada from 1982 to 1987. Canadian Voodoo operations finally concluded in April 1987. For more information on the history of the Voodoo in Canada, click here . The objective of this page is to list any Voodoo that served in Canada that still exists in some substantial form. Additional information, updates, photographs, comments and anecdotes about Canadian Voodoos would be welcome. On display at May ANGB, Reno, Nevada as RF-101B 59-0483 (July 2009). Last F-101 built. 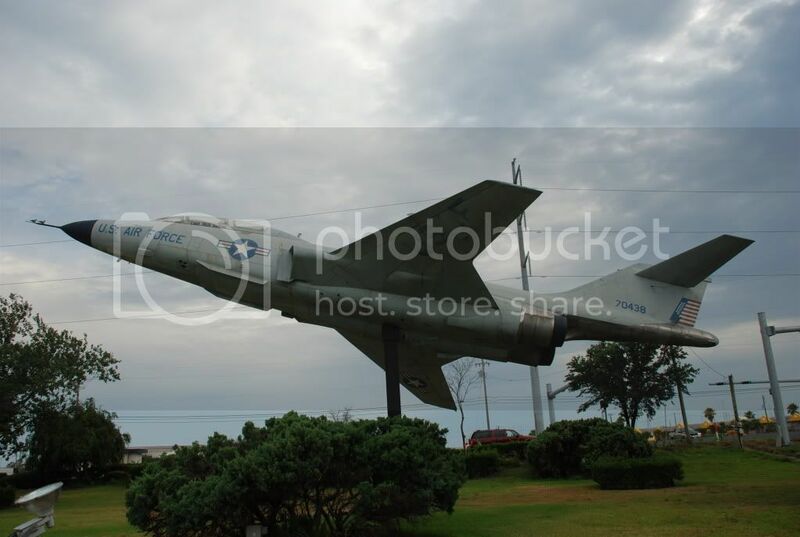 Only surviving RF-101B. On display at Canadian War Museum, Ottawa, Ontario as 101002 (July 2009). On display at Labrador Military Museum, 5 Wing Goose Bay, Labrador as 101003 (July 2009). On display at Cornwallis Military Museum, former CFB Cornwallis, Nova Scotia as 101006 (July 2009). Made final flight by an F-101, April 1987. On display at Air Force Heritage Park, 17 Wing Winnipeg, Manitoba as 101008 (July 2009). On display at Base Borden Military Museum, 16 Wing Borden, Ontario as 101011 (May 2009). Privately owned (cockpit only), Uxbridge, Ontario as 101012 (September 2007). Derelict at 3 Wing, Bagotville, Quebec as 101014 "Alouette Un Canada/Lark One Canada" (July 2009). On display at Parc Comm�moratif des V�t�rans, L�vis, Quebec as 101015 (July 2009). On display at Aerospace Museum of Calgary, Calgary, Alberta as 101021 (July 2009). On display at McChord Air Museum, McChord AFB, Washington as 101021 (July 2008). Derelict at Marana Airport, Arizona as 57-332 (August 2008). Previously on display at Tyndall AFB, Florida, removed circa 1999. On display at Canada Aviation Museum, Ottawa, Ontario as 101025 (July 2009). On display at Bagotville Air Defense Museum, 3 Wing Bagotville, Quebec as 101027 (July 2009). On display adjacent to the New Brunswick Railway Museum, Hillsborough, New Brunswick as 101028 (July 2009). On display at Comox Air Force Museum, 19 Wing Comox, British Columbia as 101030 (July 2009). On display at Alberta Aviation Museum, Edmonton, Alberta as RCAF 17425 (July 2009). On display at Western Canada Aviation Musuem, Winnipeg, Manitoba as 101034 (July 2009). On display at Abbotsford airport, British Columbia as 101035 (July 2009). On display at Slemon Park (former CFB Summerside), Prince Edward Island as 101037 (July 2008). On display at Reynolds Alberta Museum, Wetaskiwin, Alberta as 101038 (May 2008). Painted as "Lynx One Canada" to match 101043. On display at National Air Force Museum of Canada, 8 Wing Trenton, Ontario as 101040 (June 2009). On display at Bangor ANG Base, Bangor, Maine as 57-377 (July 2009). Derelict as range target at CFB Gagetown, New Brunswick as 101042 (July 2009). On display at Atlantic Canada Aviation Museum, Halifax, Nova Scotia as 101043 "Lynx One Canada" (July 2009). On display at Peterson Air and Space Museum, Peterson AFB, Colorado as 101044 (July 2009). On display at Canadian Warplane Heritage Museum, Hamilton, Ontario as 101045 (July 2009). Previously on display at CFB Ottawa, moved 2004. On display at National Air Force Museum of Canada, 8 Wing Trenton, Ontario as 101046 (June 2009). Privately owned (fuselage only), Uxbridge, Ontario as 101047 (September 2007). Derelict at 3 Wing, Bagotville, Quebec as 101048 (July 2009). Derelict at 3 Wing, Bagotville, Quebec as 101050 (July 2009). On display at Thetford Mines airport, Thetford Mines, Quebec as 101051 (July 2009). Previously on display elsewhere in Thetford Mines, moved spring 2009. On display at Miramichi Airport (former CFB Chatham), New Brunswick as 101053 (July 2009). On display at Museum of Aerospace Defence, 22 Wing North Bay, Ontario as EF-101B 101067 (May 2009). 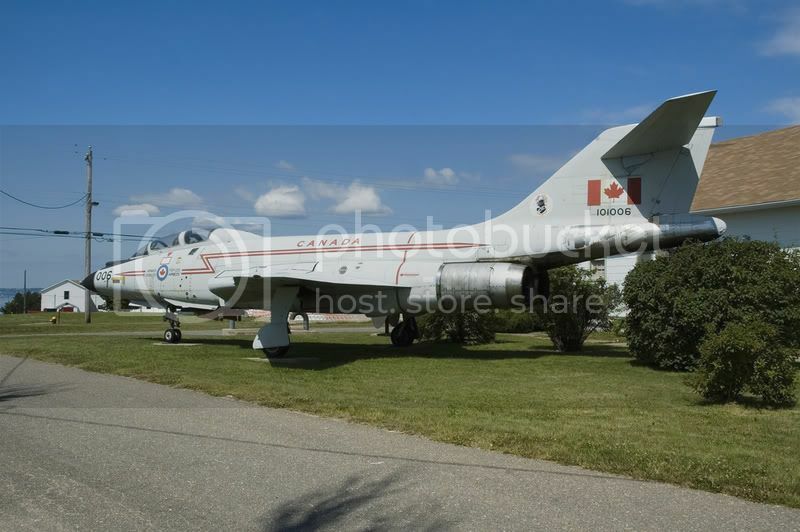 On display at 4 Wing Cold Lake, Alberta as 101056 (May 2008). Gate guardian at 19 Wing Comox, British Columbia as 101057 "Hawk One Canada" (July 2009). In storage at 12 Wing Shearwater, Nova Scotia as 101063 (July 2009). 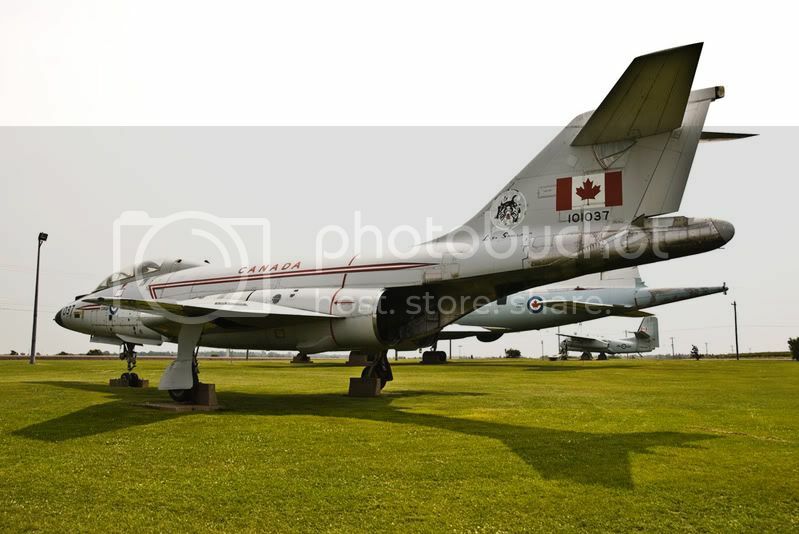 Owned by Canadian Museum of Flight, Langley, British Columbia. On display at North Atlantic Aviation Museum, Gander, Newfoundland as 101065 (July 2009). An unknown Voodoo is visible at CFB Suffield, Alberta (July 2006). Further details about the identity of this aircraft would be welcome. Previously preserved at Canadian Museum of Flight, Langley, BC as 101052. Subsequently scrapped circa 1998? Additionally, some other CF-101s may still be extant as hulks or range targets. Any information would be appreciated. Thanks to Jeff Rankin-Lowe, Andy Marden, Jerry Vernon and numerous other contributors for much of the information and updates on this list.